Last year, Dreamfields Festival which presents EDM (Electronic Dance Music), has been successfully held in Bali. Held at GWK (Garuda Wisnu Kencana), Jimbaran, South Kuta. When the music festival is held, all tickets have been sold otherwise. Even on the road to GWK (Garuda Wisnu Kencana) traffic jams occur very long. 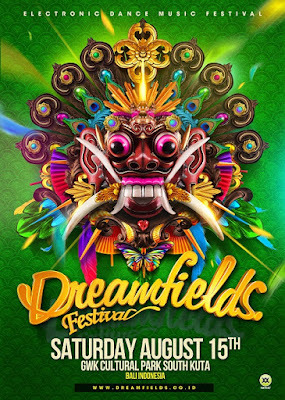 This year, 2015, Dreamfields Festival held again in Bali, the same place, at the Garuda Wisnu Kencana (GWK), Jimbaran, South Kuta. Festival of EDM (Electronic Dance Music) which will be held on 15 August 2015. Dreamfields Festival 2015 on August 15, 2015, is the second edition of this event party was held in Bali, Indonesia. For its inaugural edition last year, the festival is held under the theme "Experience The Power Of The Mighty Garuda And Elerctronic Dance Music", which was held to coincide with the anniversary of Indonesian independence. And while the line-up featuring famous DJ, Dash Berlin, Goldfish and Blink, Will Sparks, Indyana feat. Anggun, Sidney Samson, and much more. At Dreamfields Festival 2014 is an unforgettable music festival and will be remembered throughout time and also has successfully sold all tickets run out. Dreamfields Festival has succeeded in bringing together more than 50 different countries, as well as involving the local community and culture in Bali. Although the prices are quite expensive for local residents. Dreamfields Festival 2015 has announced a famous DJ who will fill the EDM music festival. Krewella, Vinai, Quintino, Andrew Rayel, Firebeatz, Moti, New World Sound, Angger Dimas, Indyana, Yasmin, and there are those who have not been shown by the organizers. Dreamfields Festival 2015 will be a means to get out of the daily routine and make everyone will be fascinated by the design stage its magnificent, dazzling series of events with a laser show, fireworks and other entertainment. Also maybe there will be a spot that will be placed as a food court area, and areas for other activities.